The rivalry between Marvel and DC is as old as the companies themselves. Sometimes it’s playful; sometimes it gets downright heated. 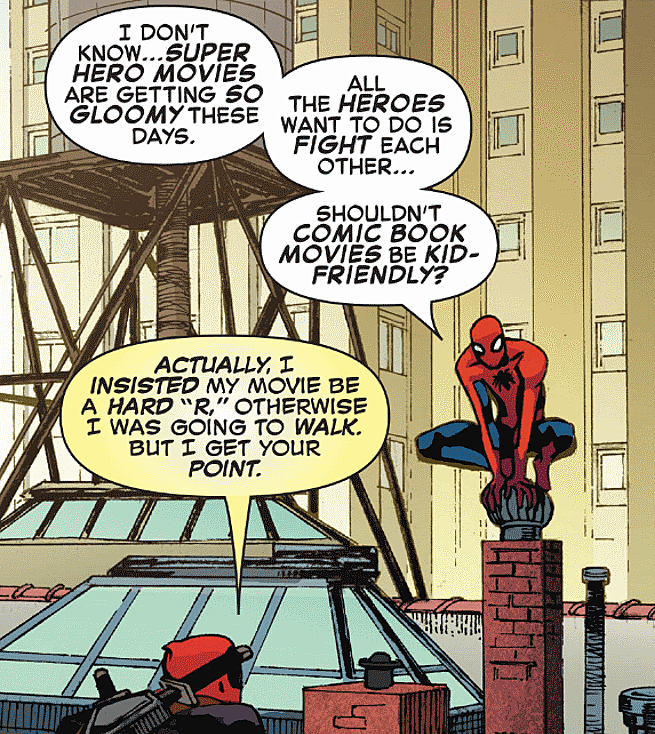 In the latest issue of Spider-Man/Deadpool, the Cold War between comics’ “Big Two” went full fire emoji. First of all, yes Spider-Man and Deadpool are currently starring in an ongoing team-up series where they fight crime and trade quips. It’s a fun book; they’re sort of like Laurel and Hardy, but with more web-fluid and chimichanga references. 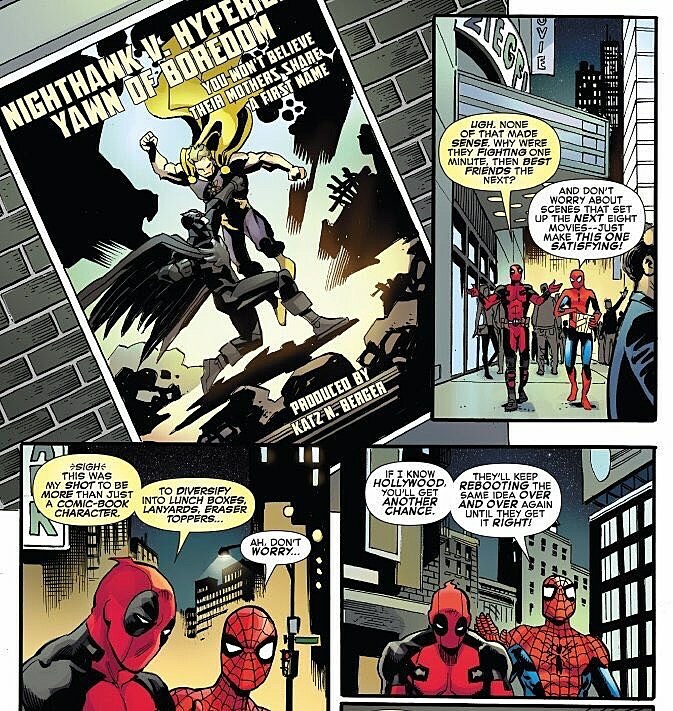 The new issue, Spider-Man/Deadpool #6, is written by Scott Aukerman of Comedy Bang! Bang! fame, and it’s all about the world of superhero movies. In the story, Deadpool gets his own Hollywood production and gets a glimpse into the modern moviemaking process. (Where do they come up with these ridiculous ideas? A Deadpool movie? It’ll never happen.) Cue the jokes about increasingly dark superhero films (and Batman v Superman: Dawn of Justice in particular)! There is no mistaking what’s going on here. Nighthawk and Hyperion are from a book called Squadron Supreme, which is basically Marvel’s analog of DC’s Justice League; each character in the group is based on a corresponding DC character, with Nighthawk as the group’s Batman and Hyperion as its Superman. There’s a joke about their mothers sharing the same first name. There’s a joke about setting up future movies at the expense of a present movie. And really there’s no better BvS putdown subtitle than Yawn of Boredom. There is also a joke about rebooting characters until they get it right. Speaking of which, Spider-Man: Homecoming is just one year away! Good to know Marvel can poke a little fun at itself as well as its competitors. You can get Spider-Man/Deadpool #6 at finer comic book stores everywhere right now.